Above cars made using the N133 decals, 4024-kits, RRR wheels, and tires. FIRST, the term A/FX was a drag racing class in the mid 1960's. It stands for "A Factory Experimental" class. A/FX is a class introduced by the NHRA in the mid-1960's because these cars had altered wheelbases, engine set back or induction systems that were not "stock", such as S/S classes. Aurora liked the sound of it, so they designated their new slot cars "A/FX". 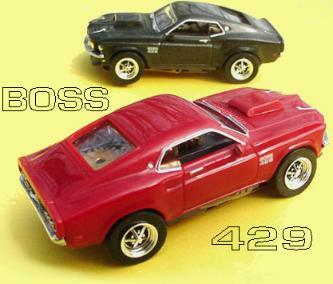 These are for T-jet or Thunder-jet DRAG Mustangs, and nothing to do with Aurora's A/FX slot cars. 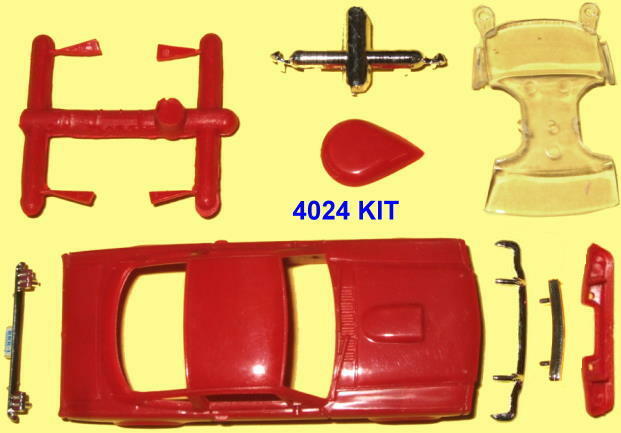 Numerous A/FX champions were made in a Mustang. 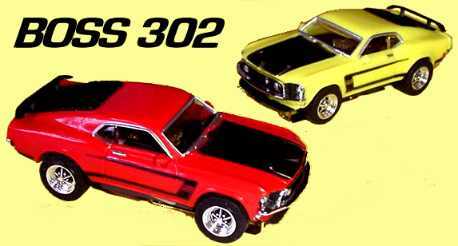 The new N133 Mustang A/FX Drag decals along with our Mustang body kit will let you recreate a wide variety of those early 60's A/FX Mavericks. You will be able to make 20+ different cars with these decals, and there are multiple variations on a couple cars, plus 2 optional schemes. 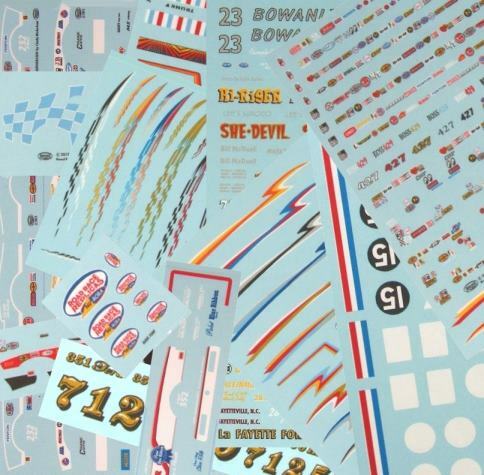 With these decals you can make 3 different DYNO-DON, 2 DIFFERENT AUXIER, NORRRIS, and others, along with Joniec, Bonner, Brannan, Lawton, Rhonda, Ireland and many more! Our decals are the finest decals made anywhere in the world, using separate clears and high quality silk-screened images ensure you will have success and ease of application. Permission granted from C. Nicholson, L. Terry, S. Auxier, B. Bonner, A. Joniec, D. Hedman. REAR WHEEL OPENING NOTE: If you plan on running your DRAG car and use a larger rear tire than a low-profile tire, the LEADING edge of the body will need to be slightly trimmed. Many of these drag cars ran with enlarged rear wheel openings anyway, so any rear wheel opening enlarging is indeed accurate.